The verbal section consists of three types of questions—Reading Comprehension, Text Completion, and Sentence Equivalence—and three types of answer structures—Single-answer multiple-choice questions, Multiple-answer multiple-choice questions, and Select-in passages. The verbal reasoning portion is divided into two, thirty-minute sections, with approximately 20 questions in each. The verbal section of the GRE contains ten passages, with anywhere from one to six questions per passage. The increased number of passages is all part of ETS’s strategy to put greater emphasis on reading comprehension and higher-level thinking. In fact, passage-based questions comprise approximately half of the total questions in the new verbal section. This interactive, comprehensive self-study course presents the equivalent of over 600 pages of printed material, including hundreds of GRE examples, problems, videos, and feedback from GRE experts to your questions. All for only $29.95! Click the link above for a tour of the course. Similar online programs cost upwards of $699! 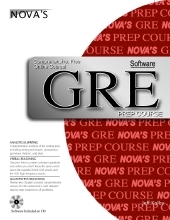 With more than $670 in savings and quality that can’t be matched, Nova Press is unquestionably the smartest option in GRE prep. Ask Questions! Our experts monitor StudyDesk to answer your questions in real-time during business hours or within 24 hours outside of business hours. Some books recommend speed-reading the passages. This is a mistake. Speed reading is designed for ordinary, nontechnical material. Because this material is filled with “fluff,” you can skim over the nonessential parts and still get the gist — and often more — of the passage. However, GRE passages are dense. Some are actual quoted articles. Most often, however, they are based on articles that have been condensed to about one-third their original length. During this process no essential information is lost, just the “fluff” is cut. This is why speed reading will not work here — the passages contain too much information. You should, however, read somewhat faster than you normally do, but not to the point that your comprehension suffers. You will have to experiment to find your optimum pace. The sentence completions used to form the most straightforward part of the test, and most students did well on them. However, with the new GRE format, ETS has decided to change the name to “text completions” and make their structure a little more complicated. The plane had been redesigned so many times before it reached the assembly line that its ________ conception was no longer ________. This format makes answering the question easier, because if, for example, you weren’t sure of the answer to the first blank but were confident about the second blank, you could use process of elimination to narrow down your answer choices. Now, questions come from passages from one to five sentences long, contain anywhere from one to three blanks, and each blank has its own set of three to five multiple choice answers (five if it is a single-blank question; three if it is a multiple blank question). Answer one of the blanks wrong, and you get the entire question wrong. Yes, the stakes are high. Use the following steps, however, to master these new question types, and show those tricky GRE question writers what you’re made of! Don’t worry about coming up with a fancy or erudite word for the blank. As a matter of fact, you can make up your own word, as long as you know what it means. Then, go through the answer choices and eliminate ones that don’t match your word. If none of them match your word, revisit the sentence to make sure you’ve understood it. Crestfallen by having done poorly on the GRE, Susan began to question her abilities. Her self-confidence was ________ . Sentence Equivalence questions are the newest and most unfamiliar test questions in the revised GRE verbal section. There are usually only 3 or 4 of this question type in each verbal section (remember, there are two sections). Sentence equivalence questions consist of a single sentence containing one blank. You must choose from six answer choices the two that best fit blank. As with all GRE questions, there is no partial credit for getting only one of the answer choices correct. If you haven’t gotten those strategies down from the previous section, go back and review those now before proceeding to this new question type. Unlike other GRE questions that ask you to select multiple answers, for these questions, you know how many answers you are looking for — two. So, we can use a very effective process-of-elimination strategy. Example: Despite receiving approbation for his work several times that year, Tim felt ________ about his job in the floundering economy. If you feel confident that you have fully comprehended the sentence, come up with your own word to fit the blank, and eliminate answer choices that are not similar in meaning to your word. For this example, you might come up with a word like “unsure” or “insecure” to fill in the blank. Then, you could eliminate (A) and (F), which are the opposite of unsure, and (D) and (E), which also do not mean “unsure.” This would leave you with the correct answer choices (B) and (C). Let’s try this out on another example. Example: Life, as the film demonstrates, is too complex for ________ endings. The sentence for this example is pretty clear; we can confidently conclude that the blank must mean something close to “easy” or “simple,” if life is too complex for it. (A) intricate does not mean “easy” or “simple,” so eliminate it. (B) facile does mean easy, so keep it. (C) ambiguous and (D) occult do not mean “easy,” so eliminate them. (E) straightforward is close to “easy” or “simple,” so keep it. (F) recognizable does not mean either word, so eliminate it. This effectively leaves us with our two correct answer choices – (B) and (E). Are you ready for the GRE? With our comprehensive books, you can be sure! Purchase GRE Math Prep Course book for only $20.97.